Three very different European cultures share one common asset: the jaw-dropping scenic splendor of the Alps. 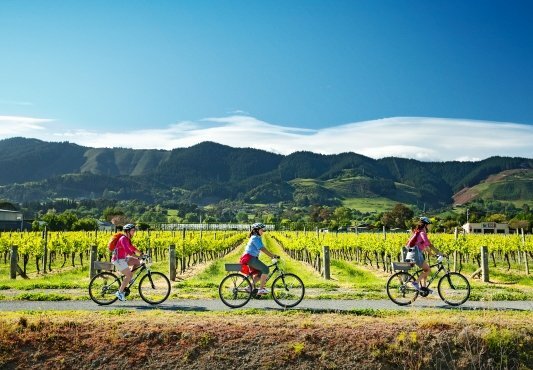 Surprisingly easy cycling reveals this majestic setting as you roll along tranquil rivers and emerald lakes, through mountain tunnels and national parks, and into towns that are popular with skiers and celebrities alike. Along the way, you’ll taste Italian wines, learn secrets of Slovenian cuisine, visit a farm, mingle with the locals at a pub, and enjoy our fine selection of accommodations—including one of the most luxurious and innovative hotels in the world. Experience three cultures on a single adventure—and even on a single day. Pedal easy cycling routes framed by the snow-capped Julian Alps and the rugged peaks of the Carnic Alps. Spin downhill on a paved rail trail through old mountain tunnels opening up on wonderful views. Visit the meticulously reconstructed town of Venzone, and view the famous 17th-century mummies in its Chapel of St. Michele. Taste the celebrated wines of Italy's famous Friuli-Venezia Gulia wine region. Hoist a pint with the locals in the pub of your welcoming hotel in Podkoren. Pause at a local farm to sample authentic Slovenian cuisine. Circumnavigate Lake Bled, drinking in its extraordinary scenic splendor. Witness a Slovenian cooking demonstration, followed by a dinner of traditional local fare. Cycle through a scenic paradise of rivers and small emerald lakes set against the Alps in Austria. Luxuriate in a Condé Nast Traveler-acclaimed “Hot Hotel” in elegant Velden. Enjoy a range of cycling options around beautiful Wörthersee Lake. Depart from home for Slovenia. The particulars of your arrival overseas are detailed with your flight itinerary. Upon arrival at the Ljubljana Airport, claim your luggage and clear customs. VBT’s local representative will meet you outside the customs area in your arrival terminal and will be holding a VBT sign. Your representative will help you transfer (approximately 30 minutes) to your hotel. The rest of the day is free for you to settle in and explore the city. Tonight, choose a restaurant for dinner on your own. VBT provides you with City Information that includes information and recommendations on what to see and do in Ljubljana during your stay. Please note: If you arrive early, your hotel room may not be available until after 2:00 p.m. You may store your luggage with the reception desk. If you are traveling from the west coast, your arrival in Ljubljana may not be until late in the evening. Upon arrival, stroll the quiet pedestrian streets of this romantic city and explore on your own. 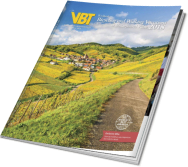 VBT Air Package guests & Pre-trip Extension guests: Meet your local VBT representative at the Ljubljana hotel at 10:00 a.m. Please come dressed in cycling clothes and ready for biking. Make sure your luggage is ready in the lobby and tagged with VBT yellow tags. If you have brought your own pedals, please have them ready to give to your Trip Leaders. From Ljubljana, transfer by private motorcoach (approx. 2 hours) to alpine Italy, where you’ll be treated to staggering vistas of the snow-capped Julian Alps to the south and the rugged peaks of the Carnic Alps to the north. 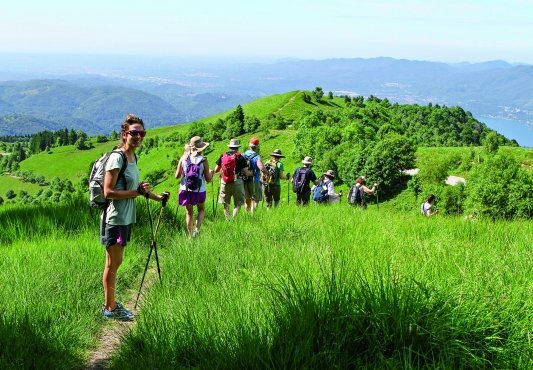 You’ll meet your Trip Leaders in a countryside setting outside the charming hamlet of Valbruno, Italy. After an included lunch, they will hold a safety and bike-fitting session followed by a warm-up ride. The area is particularly charming and ideal for easy bike rides through the scenic Canal Valley (Val Canale). This afternoon, explore the main street of Tarvisio, once an important stop on a trade route traversing the Alps to Venice. Its strategic border location has made it a crossroads of languages and cultures among Italy, Slovenia and Austria. Perhaps you’ll indulge in an Italian gelato, or visit the town’s quaint shops. Later, your small group gathers for a welcome reception and a delectable dinner prepared by your hotel owner. The Hotel Edelhof is a charming family-run inn set between the surrounding forests and the center of Tarvisio, making it easy to explore everything this small alpine town has to offer. Today, you’ll have the opportunity to experience the renowned “Alpe Adria” Bike Path, which enables cycling enthusiasts to ride from Salzburg through the Alps all the way to the Adriatic Sea. 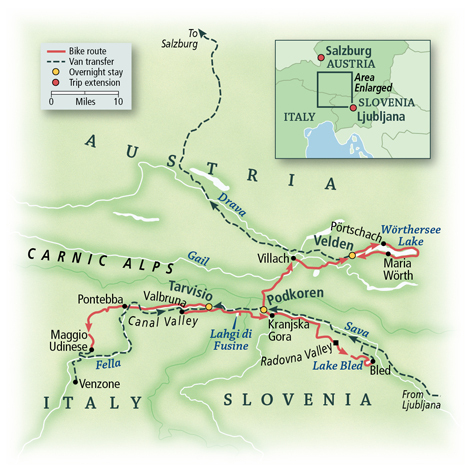 Your journey will follow the recently paved rail trail downhill from Tarvisio to Venzone, sometimes traveling through old mountain tunnels opening up on wonderful views of the Val Canale. At times you will catch glimpses of the River Fella, a tributary of the Tagliamento. You can pause in the small town of Pontebba, located at the confluence of the Fella and Pontebbana creeks. The railroad line in Pontebba was the target of heavy aerial bombing during World War II, as this was Germany’s main resource for transporting supplies to Italy. During your scenic ride, you’ll pause for a picnic lunch prepared by your Trip Leaders. 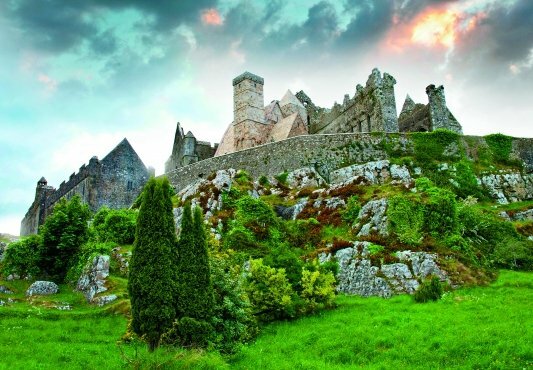 Later, you’ll shuttle to the old town of Venzone, which has been restored to its medieval splendor. This excellent example of reconstruction has been declared an Italian National monument. The reconstruction includes the Cathedral of St. Andrea, home to the mysterious Chapel of St. Michele; its famous mummies date to 1647. Prior to burial, these bodies were perfectly preserved. They were so recognizable decades later, some people periodically retrieved the bodies to commune with their dead ancestors. The town is also known for its lavender shops. Later this afternoon, you will shuttle back to your inn. Back in Tarvisio, enjoy time to relax. 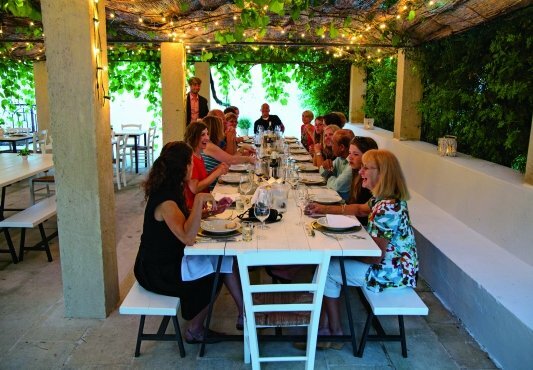 Then, join your Trip Leaders for an Italian wine tasting with a local wine expert. Choose a local restaurant for dinner on your own. After breakfast this morning, shuttle or ride to Laghi di Fusine (Fusine Lakes). Enjoy an inspiring walk around the lake with breathtaking views of Mt. Mangart. Back on your bike, ride an easy path through a pristine alpine landscape into Slovenia. Your destination is the charming village of Kranjska Gora, famous for its World Cup ski area and an adjacent peaceful retreat for nature lovers. Explore this picturesque ski resort town at your leisure and find a quaint restaurant to have lunch on your own before checking into your hotel. Later in the afternoon, take some time to settle in and relax, or enjoy a stroll before your small group gathers for a special Slovenian evening in Kranjska Gora. Enjoy a cooking demonstration at a local restaurant, followed by a dinner of traditional Slovenian fare. Your alpine adventure continues today with a ride through the Radovna Valley, passing pristine pasturelands. You’ll stop at one of the farms to sample the wonderful alpine cuisine produced in this region of Slovenia for lunch. Afterward, continue to the storybook setting of Lake Bled. 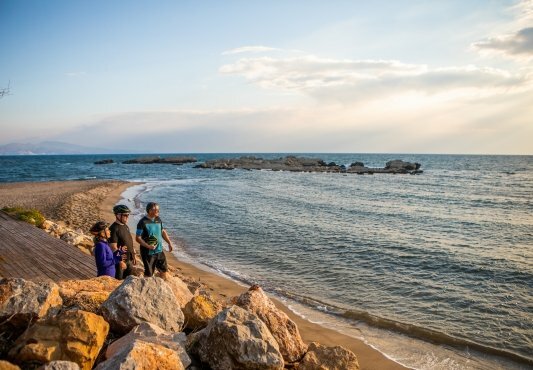 Enjoy an unparalleled experience of its splendor as you circumnavigate the lake by bike. If time allows, you may opt to take a boat to Bled Island—the only natural island in Slovenia and home to the beautiful Pilgrimage Church of the Assumption of Mary. Or walk up the hill to Bled Castle, the oldest castle in Slovenia, offering amazing views over the lake. After your exploration of Lake Bled, shuttle back to Kranjska Gora to relax or enjoy a sauna. Indulge in a hearty dinner at the inn tonight. This morning, a scenic reel on an easy bike path leads through a century-old forest into Austria. Beyond a pass—and through the immense limestone wall formed by the Carnic Alps and the Karavanken—you’ll continue cycling along the banks of the Gail River in Carinthia. This region is a scenic paradise of rivers and small emerald lakes set against the backdrop of the Noric and Carnic Alps. En route, you’ll enjoy a traditional Austrian alpine lunch at the Almwirschaft Hut. This afternoon’s longer option takes you to Wörthersee Lake. Your path follows the valley through deep wooded slopes and sunny cornfields. 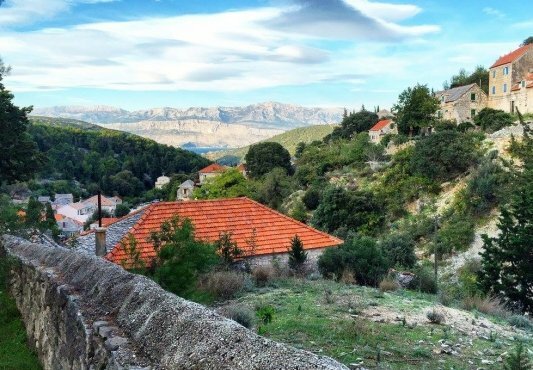 At times, you’ll catch a glimpse of church bell towers or small villages laid out like blankets at the feet of mountains. For a shorter option, stop and explore the town of Villach and wander the pedestrian streets to shop or sample a local brew. From Villach, take a short train journey to Velden and enjoy a leisurely walk from the train station to your hotel, where you’ll stay for the next two nights. Velden is a chic small town known as the little “Monte Carlo of Carinthia” for its elegant promenade, trendy cafés and restaurants, and busy casino. Home to many wealthy families of ancient lineage, it is a town of stately mansions, colorful gardens and refined lakeside restaurants. Your hotel is the magnificent Falkensteiner Schlosshotel Velden, an ancient castle on the lake’s banks. It was reopened in 2007 after a long and detailed restoration. Condé Nast Traveler has featured it as a “Hot Hotel” and its spa center as the “Hot Spa” of Austria—making it one of the most luxurious and innovative hotels and resorts in the world. Your bike ride today takes you around Wörthersee Lake. On the northern side, Pörtschach is an exclusive tourist resort, beautifully located on a little bay. 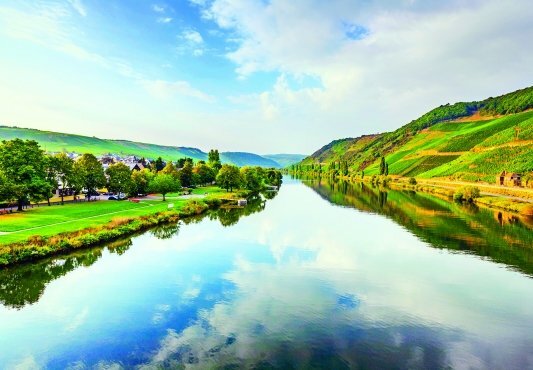 Continuing to the southern bank, you’ll arrive at the picturesque village of Maria Wörth, which features two little medieval churches and a small peninsula that juts dramatically into the lake. A more challenging option for avid bikers follows the hills south of the lake into a scenic forest. For shorter options, a boat ride across the lake helps you cover ground more quickly. You may shuttle back to your hotel and spend the rest of the afternoon swimming, relaxing or enjoying watersports on the hotel’s private beach. Thanks to the natural hot springs, the waters are sure to be warm and pleasant. Alternatively, you might choose to pamper yourself at the hotel’s luxurious spa center. In the evening, gather with your travel mates for a festive farewell dinner. VBT Air Package guests: After breakfast, VBT’s private motorcoach takes you to Salzburg, Austria (approx. 2 hours, 45 minutes) for a final overnight stay. Your hotel is ideally located within easy walking distance of all the major sites. VBT provides you with City Information that includes information and recommendations on what to see and do in Salzburg during your stay. After breakfast* this morning, transfer to the Salzburg airport (approximately 30 minutes) for your departing flight. Please ensure that you are ready in the hotel reception area at the designated time***. ***Please note: Salzburg’s airport will be closed in May for renovations, transfers will be to the Munich International airport (approximately 2.5 hours) for your departing flight. 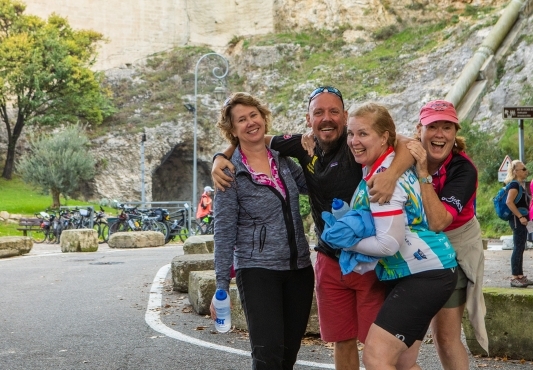 VBT-Bicycle-Vacation-only guests: Meet your local VBT representative and the rest of the group at our Ljubljana hotel at 10:00 a.m.
Tour Meeting Point Details: If the first day of your tour is a Friday, your meeting point will be the Allegro Hotel (Allegro Hotel, Gornji Trg 6, 1000 Ljubljana, Slovenia). If the first day of your tour is a Wednesday, your meeting point will be at the Lesar Hotel Angel (Lesar Angel, Gornji Trg 7, 1000 Ljubljana, Slovenia). Please come dressed in cycling clothes and ready for biking. Make sure your luggage is tagged with VBT yellow tags. If you have brought your own pedals, please have them ready to give to your Trip Leaders. If you are delayed for any reason, please contact VBT’s hotel in Ljubljana to advise the staff of any travel delays or changes. They will pass your message on to your VBT Trip Leaders. VBT-Bicycle-Vacation-only guests: After breakfast, VBT’s private motorcoach takes you to Salzburg, Austria (approx. 2 hours, 45 minutes). You will arrive around noon. Your trip ends here at VBT’s Salzburg hotel. We recommend booking flights no earlier than 3:00 p.m. from Salzburg. Hotel Goldener Hirsh is a 5-star luxury hotel situated on the renowned Getreidegasse Street in the very heart of Salzburg. Across from the Festival Hall and down the street from Mozarts house, a short walk from designer boutiques and the Salzach River, the Goldener Hirsch features 69 beautiful rooms decorated in Salzburg style and offering all the amenities of a modern hotel. Each room is exquisitely embellished with handmade rugs and furniture, handpicked by local Countess Harriet Walderdorff. Free WiFi is available in the hotel lobby. Located on a Wörthersee Lake promenade, this ancient castle has lured royalty, celebrities, dignitaries, and writers since the late 1800s. After a short time as a private residence, it reopened in 2007, wondrously transformed into a sumptuous retreat with a private lakefront, fitness center, award-winning spa, indoor and outdoor pools, library, sand tennis courts, a putting green, and gourmet, fine, and casual dining, among many other splendid features. Condé Nast Traveler has featured Schloss Velden as a “Hot Hotel” and its spa center as a “Hot Spa” of Austria, making it one of the most luxurious and innovative hotels and resorts in the world. Its restaurant, Schlossstern, has a one-star Michelin rating, and its spa was voted “Best Spa in Austria 2008” by Gault Millau. Your elegantly appointed room includes a television, a refreshment center stocked with complimentary beverages, and bedside touch-panel controls for lighting and drapes. Free WiFi is available throughout the hotel. This quaint, family-run alpine lodge is located just blocks from Tarvisio town center. The hotel boasts a wonderful restaurant serving traditional cuisine from this area of Italy. The hotel has a Spa & Wellness Center with services available at an additional cost. Treat yourself to the sauna, Turkish bath, and hydro and chromo therapies. Each handsome room, many of them decorated with hand-painted details by local artists, features wooden floors with traditional wooden furniture. Free WiFi is available throughout the hotel. Set in the center of Ljubljanas Old Town, at the foot of Castle Hill, the Allegro Hotel is the perfect base for exploring the capital of Slovenia. Yet it also provides a soothing, tranquil ambiance, buttressed by the friendly hospitality of the staff. As is traditional for many European hotels, each of the elegant and lavishly decorated rooms offers a unique décor. In your room, enjoy a view of St. Jacobs Church or its bell tower, or of the street and Ljubljana Castle, as well as climate control, flat-screen cable TV, a telephone, in-room safe, and private bath with hairdryer. And enjoy the hotel bar and private garden. Free WiFi is available throughout the hotel. Ramada Hotel & Suites Kranjska Gora is located in the heart of Kranjska Gora next to the main promenade and easily accessible to everything this ski town has to offer. The comfortably furnished rooms offer a view of the mountains and the beautiful surroundings make it a perfect place especially for guests expecting the best comfort from their holidays. The hotel also offers special antiseptic rooms for guests susceptible to allergies. The rooms have French beds, shower/WC, cable TV, phone, WiFi, mini bar, safe and a teapot. Upon arrival at the Ljubljana Airport, a VBT representative will meet you outside the customs area in your arrival terminal. The representative will be holding a VBT sign and will help you transfer by private car or van (approximately 30 minutes) to your hotel in Ljubljana’s historic old town. The rest of the day is free for you to settle in and explore the city. Tonight, choose a local restaurant for dinner on your own. VBT provides you with City Information that includes information and recommendations on what to see and do in Ljubljana during your stay. This morning, meet your guide in the lobby of the hotel at 9:30 a.m. for an included walking tour of Slovenia’s capital city. Stroll the quiet pedestrian streets of this romantic city and explore the central market, where local produce, wooden crafts and native flowers are on display. Follow the Ljubljanica promenade and delight in its small, unique bridges: the Cobbler’s Bridge, the Triple Bridge and the Dragon Bridge. Ljubljana is large enough to be a bustling national capital, but small enough to preserve the individuality of its inhabitants. To blend in with the locals, sip a distinctive, Slovenian Vinotek vintage at one of the many streets cafés, lively and cozy any time of day and romantic at night. After breakfast, continue exploring Ljubljana. You might choose to take a funicular cable car to the Castle, or visit the Cathedral, the Baroque Old Town, and the Art Nouveau Mansions. Or take an optional trip to visit the Postojna Caves, the longest system of Karst caves in the country. Dinner is on your own tonight. Stroll the streets of this romantic city and explore independently today. Visit the Mozarteum, a museum dedicated to Mozart’s life, or several other artistic centers, such as the Carolino Augusteum or the Baroque Museum. See the cathedral or St. Peter’s Abbey. Salzburg’s city center is easily walkable and contains a number of outdoor cafés and restaurants. Tonight, dinner is on your own. After breakfast, continue exploring Salzburg on your own, perhaps seeing some of the settings made famous in The Sound of Music. At Mirabell Palace, you might see the steps that Maria and the children used as a musical scale. Dinner is on your own tonight.